Merseyrail staff have assisted a family by transporting a giant teddy bear back to their home town in Chester. 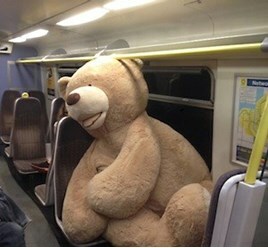 Too large to fit in the family’s car, Hugo the bear was taken to Birkenhead Central station to travel by rail instead. Staff helped the family to get the ten- foot toy on and off the train. Nine-year-old Gabriela Tanianis-Hughes had won Hugo at a charity fundraising event in the Wirral.